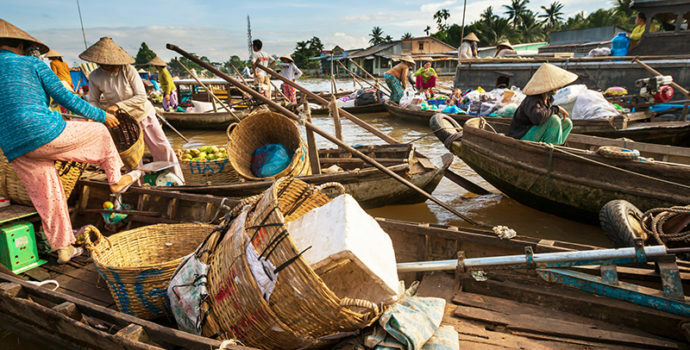 On Day 1, arrive in Ho Chi Minh City, get settled in, and explore the city’s Old Market. 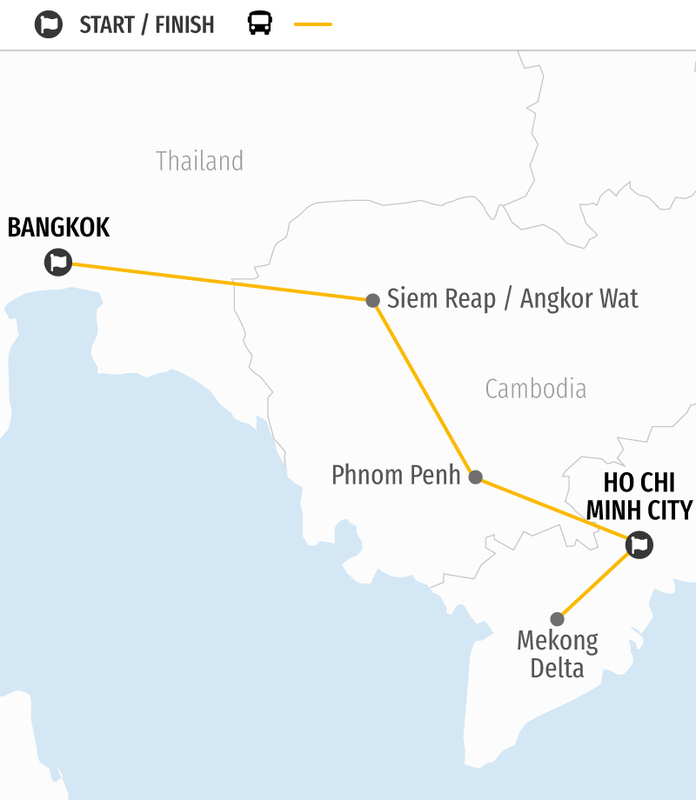 On Day 2, boat all day through the Mekong Delta and on Day 3, travel to Phnom Penh. On Day 4, take a bike tour a visit two historical sites. On Day 5, travel to Siem Reap and on the way visit a fair-trade silk farm and try deep-fried spider. 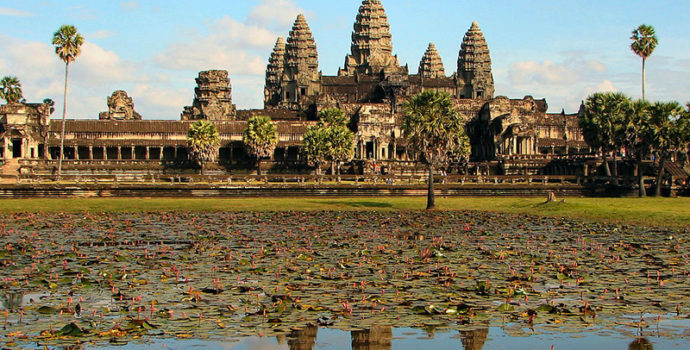 On Days 6-7, explore the temples in Angkor Archaeological Park and on Day 8, take a long bus ride to Bangkok. Your trip concludes on Day 9 in Bangkok. Welcome to Ho Chi Minh City, Vietnam’s biggest city by population formerly known as Saigon. Once you’ve arrived and checked into your hotel, enjoy some free time to explore the city. Known as the economic capital of Vietnam, Ho Chi Minh City is a vibrant hub of culture, history, and cuisine. During your free time, you may head to a museum, the Saigon Zoo and Botanical Gardens, one of the hundreds of theatres, cinemas, or restaurants, or simply stroll in the city center amid its beautiful roadways lined with historic French-colonial buildings. At 6 p.m., join your local tour leader and fellow travellers for a group meeting, where you’ll be briefed on all the information you’ll need for your trip. 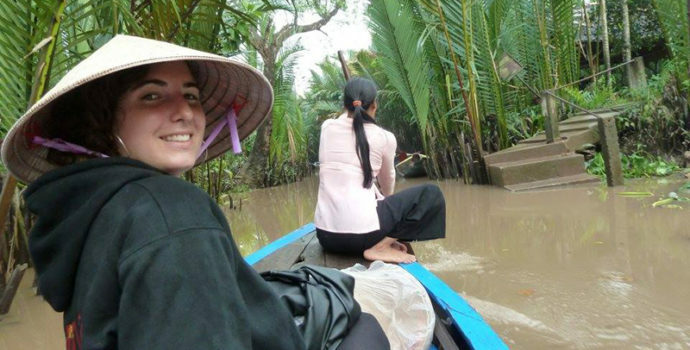 Then, you and your new friends will venture with your tour leader to the Old Market, or the Binh Tay Market. One of the largest markets in Ho Chi Minh City, the Old Market will provide you with an authentic Vietnamese cultural experience. Take in the myriad of interesting sights, smells, and goods for sale, and learn about local Vietnamese cuisine on a guided street food tour. Try local foods such as Banh Xeo, noodles, and rice with pork ribs (at your own expense). Overnight in Ho Chi Minh City. 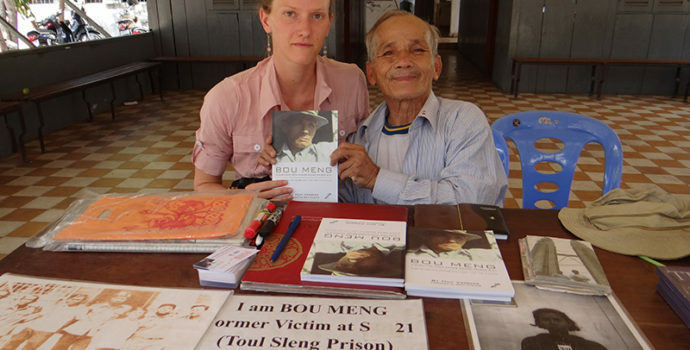 Board a bus on the morning of Day 2 and travel to the mostly isolated Ben Tre province. 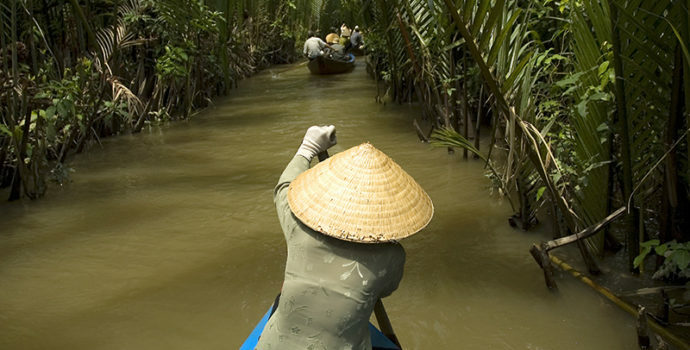 Situated in the Mekong Delta, the Ben Tre province contains a series of canals and rivers, and is a big producer of rice because of its irrigation systems. 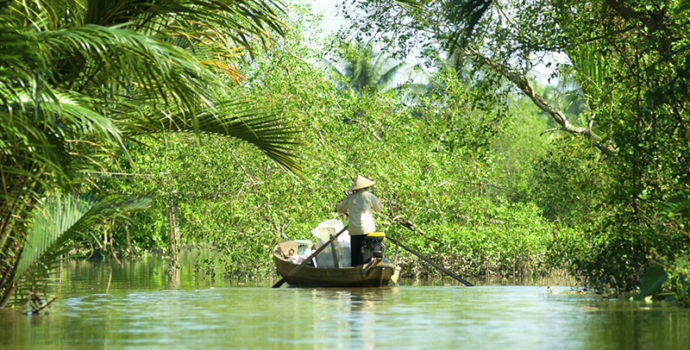 You will arrive to Hung Vuong Pier and board a boat, or sampan, that you will take down the Ben Tre River. As you calmly ride down the tributary lined with mangrove trees, take in sights of locals fishing and cargo boats hauling coconuts. Make a stop to see how bricks are traditionally made and then go down the Cai Son canal to get a firsthand glimpse at how coconuts are husked and cracked open to reach the tasty fresh “meat” inside. Venture down another canal lined with palm trees and visit a coconut candy mill and bee garden, taste fruits and honey tea, and hear music throughout. Hop back on your boat and then take a short walk to see traditional Vietnamese sleeping mats being made. Your day continues with a tuk tuk ride or bike ride through shaded paths, past a coconut jungle and pastures where vegetables and fruits such as cucumbers and bitter melons grow. You’ll have lunch at a riverside restaurant before embarking on a rowboat down a water palm creek. Eventually you will boat back to Hung Vuong Pier and take a bus back to Ho Chi Minh City. Overnight in Ho Chi Minh City. This morning, take a bicycle rickshaw ride to see some of Phnom Penh’s historic buildings in the riverfront area. 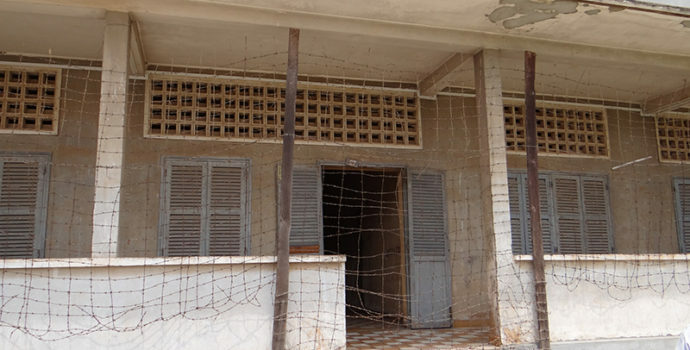 Then, learn about the history of Cambodian genocide and visit the Killing Fields of Choeung Ek Memorial, the mass grave of the Khmer Rouge victims who were murdered between 1975 and 1979, and the S-21 Prison Museum. 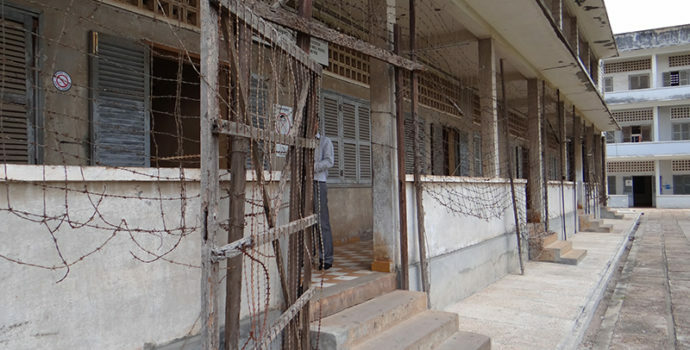 After, visit Tuol Sleng, a former school that was once a Khmer Rouge torture centre where more than 20,000 people were held and tortured. Today you will board a private bus and make the approximately 7-hour journey to Siem Reap, making a few stops along the way. First, you’ll have the chance to be adventurous with your taste buds and sample a deep fried spider in the Skun District, on your way to Siem Reap. Then, visit the Santuk Silk Farm, a fair-trade silk farm that provides work for rural communities. Here, you will observe the process of making silk, from feeding the silk worms all the way to producing the end product. In the evening, you will arrive in Siem Reap and check into your accommodation to relax, or perhaps you will explore the street food vendors a bit before bed. Overnight in Siem Reap. 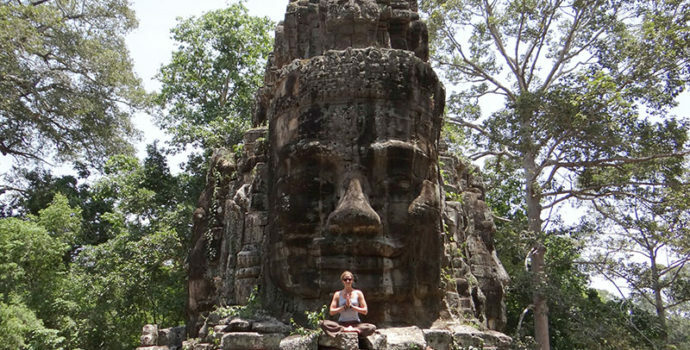 Day 6 is your time to explore the impressive ruins at Angkor Archaeological Park with your group. You will have the option to start your day before dawn in order to watch the sunrise over the temples. Otherwise, begin the tour with your fellow travellers at the most famous and best-preserved temple in the entire park: Angkor Wat. The temple is the largest religious monument in the world and is Cambodia’s signature attraction for tourists. Next up on the tour is Angkor Thom, where you’ll see the temple Bayon, which is adorned with more than 200 faces on its outside walls, Phimeanakas, Baphuon, the Terrace of the Elephants, and the Terrace of the Leper King. Your morning will end with a walk down a road lined with stone gods and demons, the road leading to Angkor Thom’s iconic South Gate. There you can snap photos and marvel at the four, large stone faces looking in each of the cardinal directions. 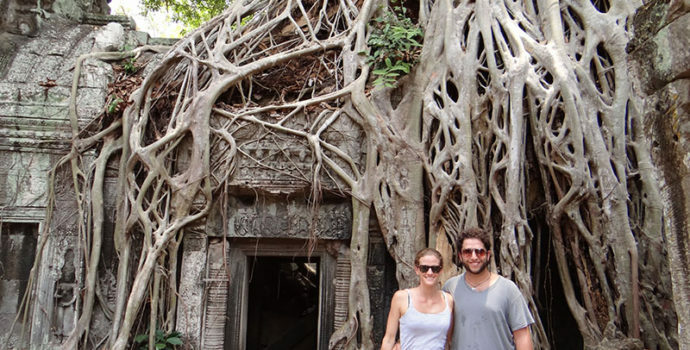 On Day 7, enjoy another morning exploring the Angkor temples and then head to a rice wine tasting tour. There you will learn about the local Khmer tradition of infusing rice wine for medicinal purposes and the flavored rum recipes from the islands. You will have the afternoon free to continue exploring or participate in another optional activity, such as a boat trip down the Tonlé Sap, a freshwater lake that flows into the Mekong River. Overnight in Siem Reap. On Day 8, you will take an 8-9-hour private bus ride across the Cambodian border at Poipet and enter Thailand at Aranyaprathet. Once you complete the border crossing procedures, you will begin your journey to your final destination: Bangkok. Depending on when you arrive, you might get a chance to explore the bustling streets of Thailand’s capital that are filled with food vendors, tuk tuks, and colour, or go out and experience the city’s exciting nightlife with your new travel friends. Overnight in Bangkok. Your trip ends on Day 9 in Bangkok, with breakfast at your accommodation. Today you will bid farewell to your new friends and check out of your accommodation. If you choose to continue exploring the city or plan to return home, we wish you safe travels!